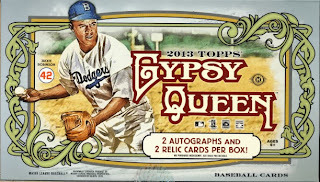 Topps Gypsy Queen Baseball Cards, which is based on the 1887 N174 release, is now in its third year. While this is still a set the builders look forward to putting together, some of the luster is gone compared to the first two releases. But on the plus side Topps has kept the multiple levels of commitment for set builders and made the photo variations much easier to spot. Gypsy Queen falls under our classification of trading cards. You can find it in retails and hobby form with Hobby Boxes containing 24 – 10 card packs with a box topper of 10 minis and 2 relic and 2 autograph cards.